Leigh Elko is Certified Tincher Pitching Instructor and a Gold Level (now the equivalent of PGF) veteran with years of coaching and research experience. 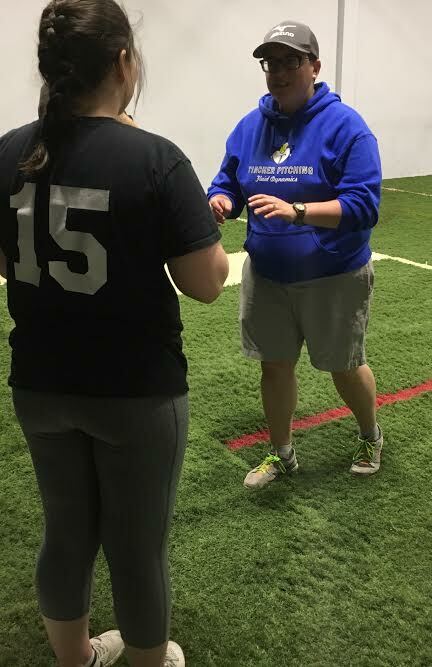 Elko owns Black Cat Fastpitch and is dedicated to making the game of softball more than just a competition – Elko builds her company on the ideas of commitment, integrity and simply “doing the right thing” when it comes to training our finest young athletes. Elko and Black Cat Fastpitch care about your success on the field, in the classroom, and in the growth of the player as a whole – we call it the “Whole-istic Approach.” Over the past ten years, Elko has coached multiple national tournament teams, directed more than 100 camps and clinics, and has provided private lessons in the areas of pitching, catching, fielding and hitting. Most notably, Elko strives to provide inclusive practices and uses her background in counseling (see below) to connect with young athletes that may struggle with emotional disorders, cognitive delays, processing issues and other developmental disorders. Elko and the Black Cat Fastpitch staff proudly provide adaptive instruction when needed, including facets of a child’s IEP or goals established by the athlete and the family. Elko has a unique background in that she has focused her attention on developing as a softball player as much as developing into a young academic. Elko earned a Master’s degree in Clinical Counseling from the University of Pennsylvania, and uses her background in psychology to address the mental aspects associated with being a pitcher and a catcher – the two positions under the most amount of pressure on the field – the two athletes who are expected to be leaders even in times of distress. Come find out what “having it” mentally is all about when you’re a pitcher or a catcher. This is what Denny says about Leigh. “She comes right at you. Leigh is one of those people who gets right in front of the kids, engages them, and gets results. Her background and education are so well-suited to the job and she brings a confidence that spills over to the kids. Finding specific ways to reach each kid and bring out her best is an important strength Leigh brings to our organization”. What Leigh has to say about Tincher Pitching: I’ve always had dreams and aspirations to apply my academic background to the sport I grew up playing and loving. I had the opportunity to chat pitching with a Tincher instructor, and immediately knew this was the organization for me. We spent hours discussing the science of the fundamentals behind pitching, and why our bodies as females vastly differ from that of the male – hence needing much more specific maneuvering than what was already out there in the realm of pitching. I’ve stuck by my goals of keeping my coaching about the kids – for me, it’s about impacting the lives of the kids we coach in many more ways than just softball – and Tincher Pitching shares that heart and soul.